The key to getting the most out of life is great vision. That's why the Boone Vision Center is dedicated to providing you with the best in quality eyecare service. We want you to experience all the world has to offer, so we offer a wide range of products and services including comprehensive vision and eye health exams, one of the largest selections of eyeglass frames in Iowa, and complete range of contact lens services. The Boone Vision Center moved to our modern, spacious location in 2000. We have continued to incorporate new equipment and procedures into our examination rooms and optical dispensary as part our our effort to provide our patients with superior, state-of-the-art eyecare. If you are in need of eyewear, our highly trained staff of opticians are ready to assist you in selecting glasses that that will meet your vision and fashion needs! 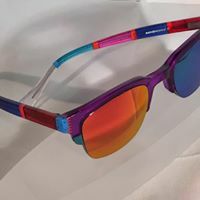 We carry a wide range of fashion frames and sunwear including RayBan and Oakley and our opticians will make sure you look and see great in your new glasses! We accept most vision and insurance plans including VSP, Avesis, Blue Cross Blue Shield, Medicare, and Medicaid and offer convenient times for examinations, including Saturday morning and Thursday evening appointment opportunities. Please give us a call and we will be happy to schedule your appointment!